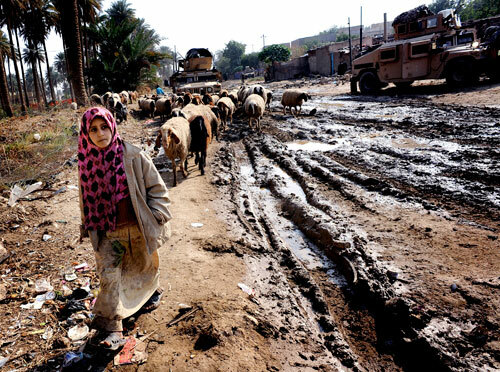 An Iraqi girl leads her sheep past Fisher's Humvee in a neglected section of Diwaniyah. Fisher tries to remain indifferent to the poor conditions and the local people. "I just want to do my job," Fisher said. "Come home safe. That's it." But later, Ian would send an email to his mother that reflected otherwise. Ian wrote about Iraq - the squalor everywhere, the anger of some locals, the disfigured victims and the looming danger and uncertainty. Things people back home couldn't understand.